Pancake day is the best day. I don't know many people who don't like pancakes and now that we live in a world full of 'alternative' pancake recipes, there's no excuse not to indulge yourself in such a good day. 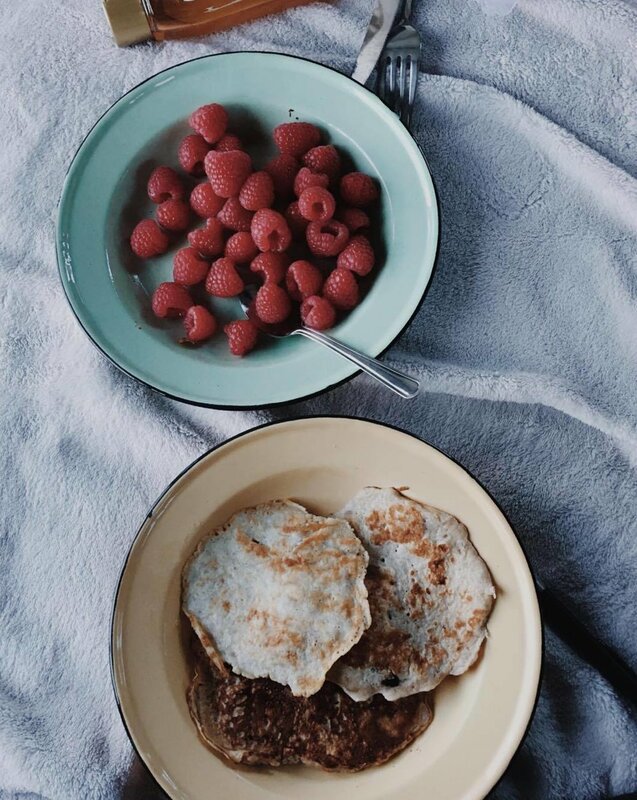 Choosing to live a life with as little refined sugar as possible means that this year's pancakes consisted of 3 eggs, 1 & a half bananas topped with raspberries, peanut butter and agave syrup. The most simple and delicious pancake recipe I've ever come across. Part One - Food. 1: Whisk your eggs in a bowl. 2: Mash up your ripe bananas on a plate. 3: Mix eggs and banana together. 4: Fry like regular pancakes.5: Add preferred toppings and enjoy! Part Two - Food for thought. "Pancake Day" is what Common Wealth countries call Shrove Tuesday, which is not something my family has ever really acknowledged growing up. However, when I moved to the UK and learnt about this widely celebrated day, I couldn't stop my curiosity, mostly driven by pancakes and made it my business to find out more and get involved. Here's what I've learnt;According to wikipedia, "Shrove Tuesday" comes from the word shrive, which means absolve (aka wipe the slate clean). Shrove Tuesday is the day preceding Ash Wednesday which marks the first day of Lent - also something my family and I didn't practice growing up, but is observed by many Christians. Wikipedia tells me that Shrove Tuesday is about self-examination, considering what areas in one's life could do with adjusting or correcting, and being intentional about spiritual growth. My thoughts on lent have changed a lot over the years. My perspective growing up was that it was a deeply religious act which many christians (and non) would use to give up chocolate or crisps in order lose a few kgs.... or at least this is what my friends and I did. (No shame). And now, my slightly older, more educated perspective is that if you're interested in growing, both spiritually and as a person, Shrove Tuesday (pancake day) is a great time to pause and reflect on what needs to change or improve in one's life. Marking a day to consider what your heart needs in order to move closer to God's heart is in my mind wonderful, especially if this time is shared with pancakes! Whether you have a relationship with God or not, and are keen to challenge yourself spiritually I would highly recommend you give this 40 day journey a go. There doesn't need to be any specific rules, and it is allowed to look like whatever it needs to be for you to engage with it. So personally, I have always given up one thing, and taken up two things. Lose one bad habit, gain two good ones, right? Well... this way of doing Lent works for me, and since God is a personal God who likes to meet us where we are, I'd say figure out a way of doing this that makes perfect sense to you. If you're interested, I would highly recommend figuring out what the next 40 days need to look like for you on a personal level. Anything 'religious' like Lent will have so many perspectives, experiences and opinions, so my thought on this is that if you keep God's heart at the core of your 40 days, taking on this challenge and seeking growth from it through daily prayer will only produce good fruit. There really is nothing to lose (except maybe that one bad habit, ha). Part Three - The Adventure.We are designed for a life of abundance, a life that fills us up and one that we truly enjoy. Adventure and quality time with people I love does this for me. So while you're being intentional, why not be intentional about WHERE you eat your pancakes? This morning's pancakes were enjoyed while watching the sunrise at Pendennis Point.Whatever it is that fills you up, that one thing or person that makes you smile, try incorporate it while you enjoy your pancakes! Save As Draft: beauty over perfection.